So… school is almost out. One more day. Kids get out at noon. That cannot come soon enough. 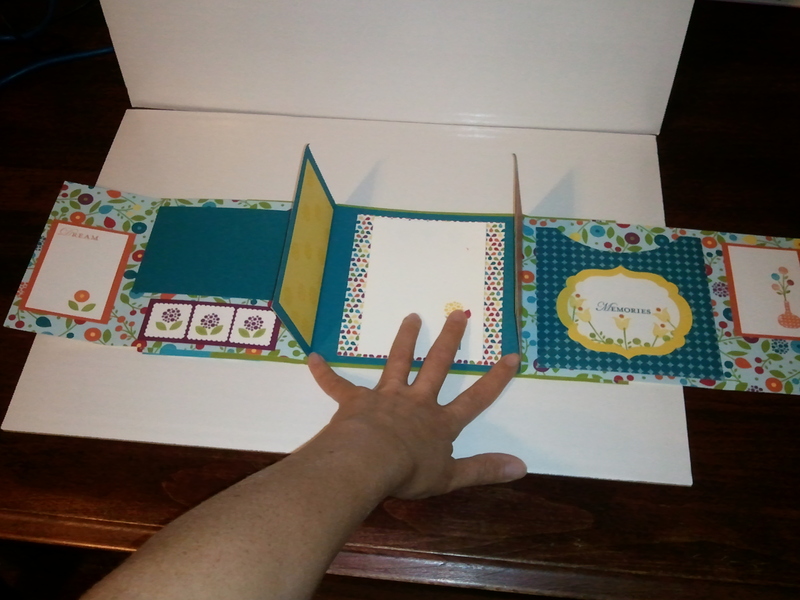 Anyway, I was recently asked to create 2 scrapbook albums (nearly identical) as gifts for a friend’s daughter-in-law and her mother. The books covered the grandchild’s first birthday. Little girl, so we got to do it up right. Very different creating things for a girl than a boy… I gotta say… a little more fun. There’s lots more ‘stuff’ to use and you can make it as foo-foo as you want. And, yes. It is a technical term. This was a fun project… Everything came together very well. I was very happy with the results. And, so was my friend and her family. They were gifts for mother’s day…. Just wanted to take a moment to wish all the Mother’s, Aunties, Sisters, Neighbors, friends… Anyone who had a hand in raising another human being, a HAPPY MOTHER’S DAY. I’m only a couple of years in, and have QUICKLY learned that it is a job that needs A LOT of help from others. So… Thanks!! A couple of weeks ago, Anne and I took a road trip to Cheryl’s house (WAAAAY out in Haiku…for Maui people, that’s far… for mainland people…it’s about the distance to your nearest starbucks…give or take). 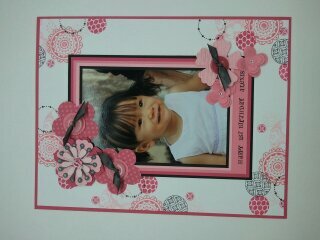 She had put together a class making a vintage picture frame. Neither Anne nor I could attend the class so she did a special session, just for us. (Made us feel like QUEENS for the day, too…). It was absolutely wonderful. I am usually on the preparation side of classes, which I do enjoy, but it was nice just to go and create. And she did all the work. And, I gotta say, the result was nothing short of incredible. 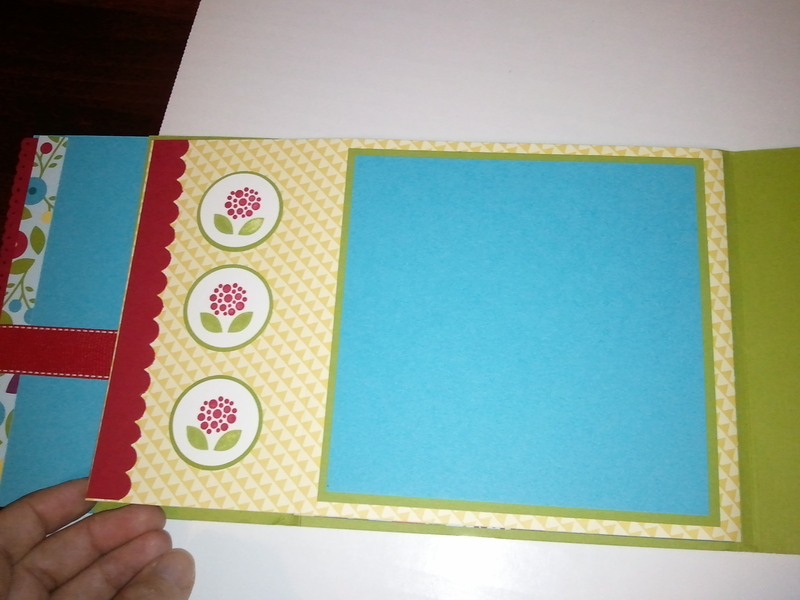 (All thanks to her design, planning, and execution…I just put tombow on the back of the pieces and stuck them on). I didn’t want to show this earlier as it was a Mother’s Day gift for my mother-in-law, but now that she’s seen it, I can let the cat out of the bag to the rest of the world. So, it has a very vintagee, collagee, feel with a touch of pool party. My blog photography skills have yet to be honed, but you get an idea. The primary colors in this are soft suede, very vanilla, and crumb cake. We did a lot of sponging edges. 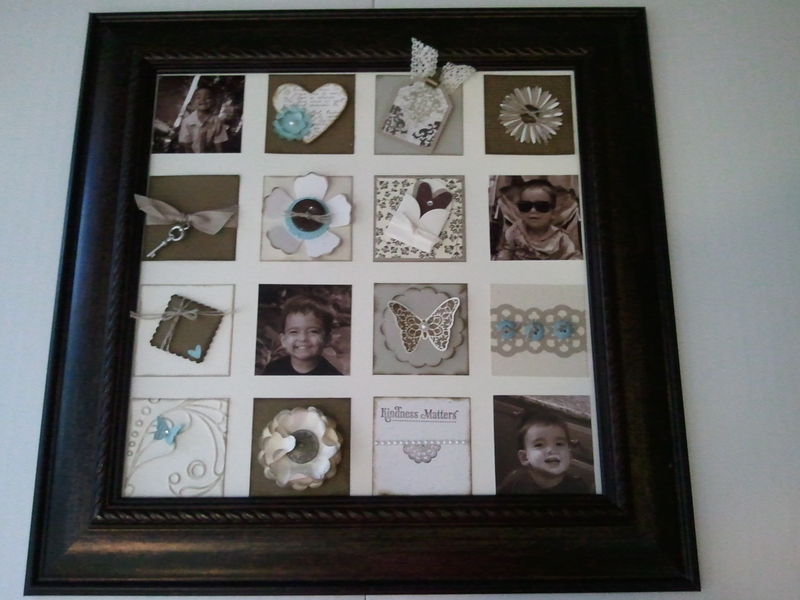 The pictures are printed in sepia tones and just put in where they go!! I had such a good time! Thanks, Cheryl, for a GREAT day and a GREAT gift…. 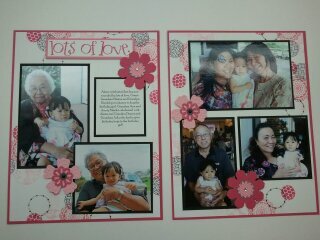 So, I teach at Maui High School and run the Teen Parent Program. This year, we are making favors on each of the holidays to as a fundraiser. 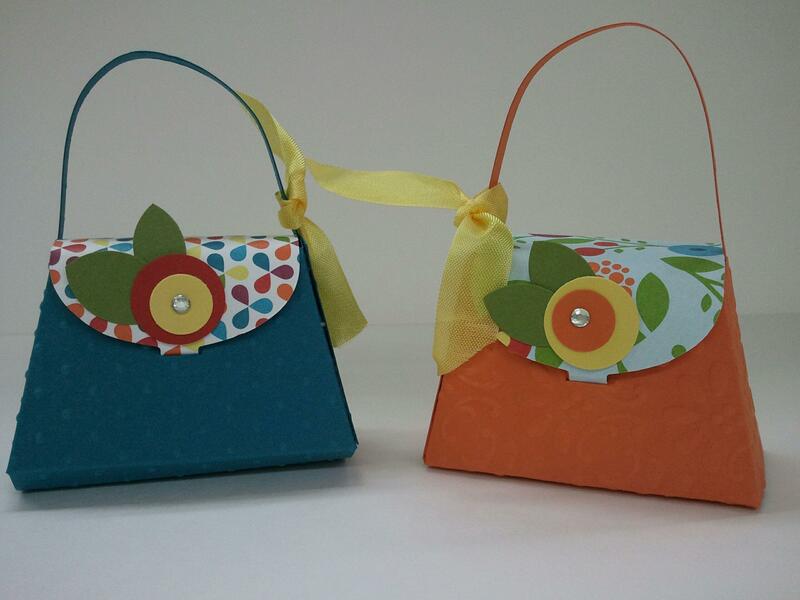 So, for Mother’s Day, we are making and selling the purse favors. (I absolutely LOVE this purse die). They are $2 each and will have 3 chocolates inside. Let me know ASAP if you would like to order. Proceeds go to fund class activities, community service projects, and to buy toys for our childcare center. 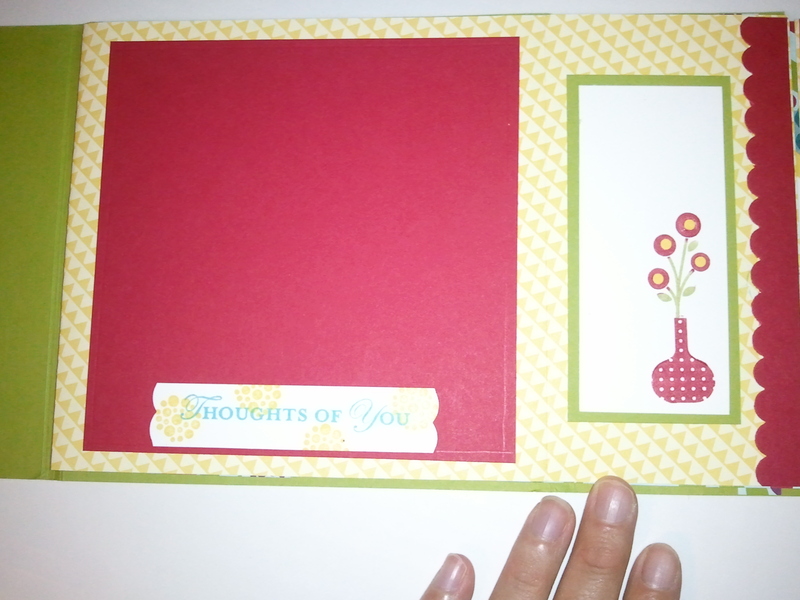 We also have sets of cards (4 cards for $5…birthday, thank-you and 2 blank) that are available. These would also make great Mother’s Day gifts. You will notice that the green cover of the book doesn’t touch in the center. That is why the red and turquoise panels are added… to make it actually close all the way. For those of you with kits, you won’t have all the same stamps (especially the words) but you can substitute whatever. This is so you can personalize and make it work for what you need it to. The yellow dots inside the red flowers… yellow circle bits. Extremely detailed, so you don’t have to if you get your fingers glued together (which I do…Anne made this one for me—I just gave up my secret). I think Anne included two LONG tangerine panels in the kits. You can cut it into 2 pieces to make the two panels on the right side. She wanted you to have the options. We are all about options. The white panel folds out. 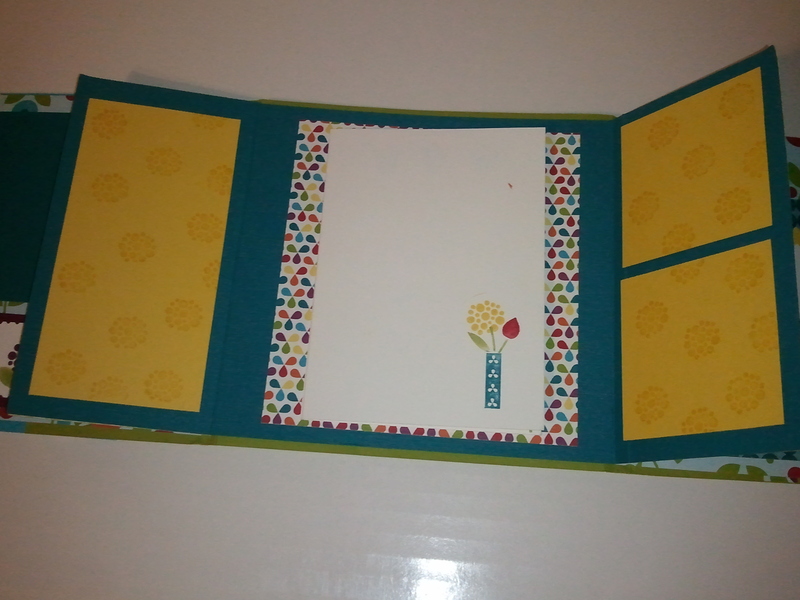 Decorate however you want (something small in the corner of each page, like on front) just make sure the fold is on the left and the open is on the right. There is the LONG tangerine panel… again, can be split into 2 pieces if you want. the middle is for a cd holder. The oval half shape is free handed (we found something to trace). Could use a punch or whatever. 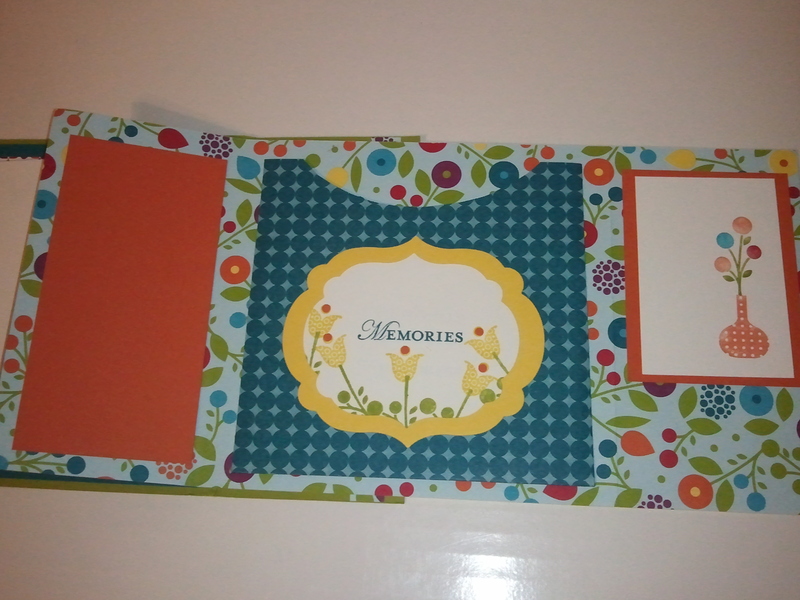 I thought Anne was very clever in designing this with a CD holder… This way, you highlight the really special pictures and memories in the flip book, and put the 200 other pictures on a disk, and store it all together!! Very ingenious!! Anne did such a brilliant JOB of getting this all together!! 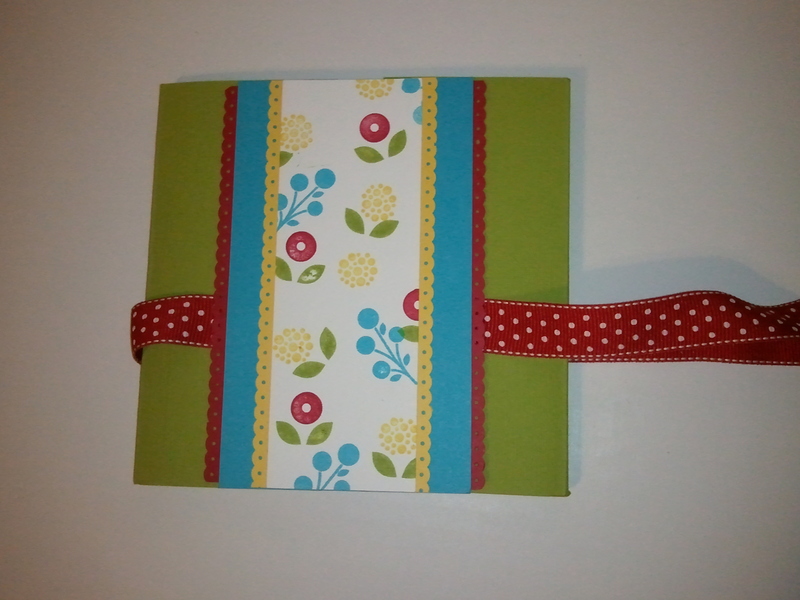 Sorry, though, there aren’t any more flip book kits left. 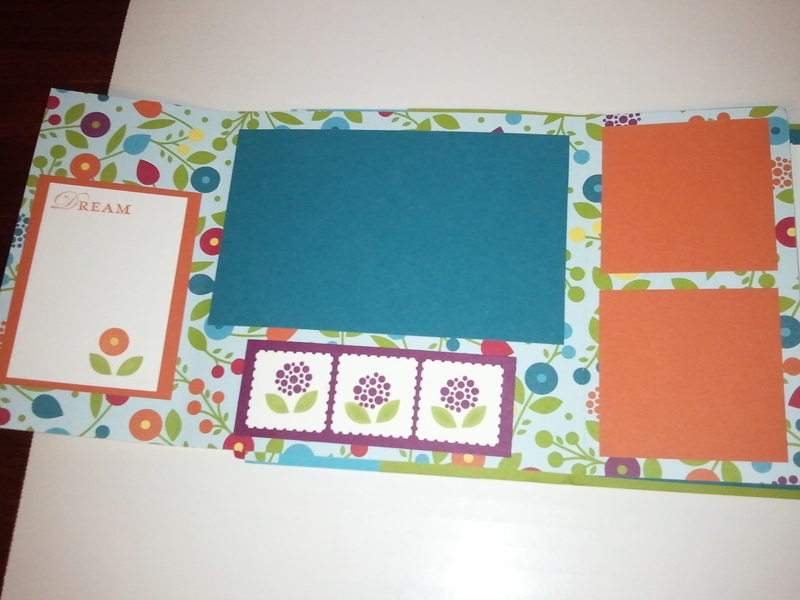 But, I do have 2 more kits for the cards we made in the first class (see previous posts). If you want one, let me know (and fast) before they are gone!! WHEW…. that was a lot… Hope you enjoyed these books. They seem complicated, but they really aren’t. And, they would BE A GREAT GIFT (with photos, of course) for Mother’s Day. 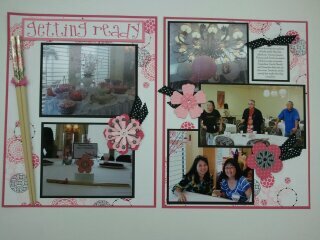 AND, they would be a great project to celebrate National Scrapbooking DAY! !